Another summer thunderstorm, another power outage. Tree limbs laden with ice from a winter storm down power lines across the county and the result is hours without power, waiting in the dark and cold for the power to come back on. If it seems like there are more and more incidences of electrical power outages, you are right. Five hundred percent more outages in the U.S. than just 10 years ago. We can thank an aging infrastructure and an overtaxed electrical grid for the loss of power. There are more people demanding more power each day, whether the sun is shining or not. More appliances, more devices, more TVs, more landscape lights, more of everything and each item you plug in requires power. You probably have a great deal invested in your home and your belongings. You want your family to be safe and feel both safe and secure in your home no matter how long the power is out. It is hard to keep everyone calm and keep your life running at normal speed when you are sitting in the dark. Not knowing when power will be restored is worrisome. Will your food spoil? Will the house become unbearably cold during the night? Will the basement fill up with storm water? How can we take a shower in the morning without hot water? We all have wonderful appliances and home systems that make our lives easier and in the case of a security system, more secure. 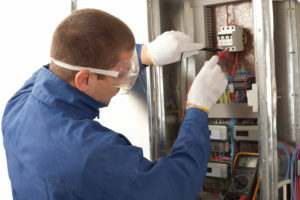 A whole house generator is the one system that all the other systems in your home will rely on if there is an extended power outage in the Fishers area. There are parts of the country that routinely experience days and weeks without power, will central Indiana be next? A standby home generator is completely automatic. It has sensors that monitor the flow of electricity into your home from the electrical utility. 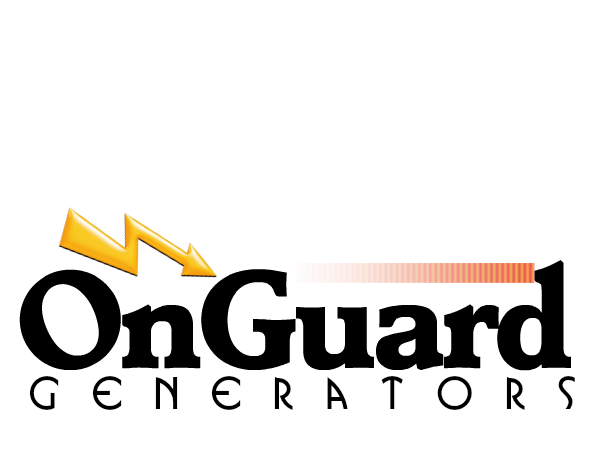 When it detects an interruption, it engages and starts up its motor, delivering electrical power to the circuits in your home usually in less than a minute. 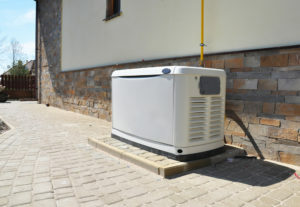 The generator unit sits quietly outside of your home, usually near your electrical panel. It runs on either natural gas or propane. Natural gas generators get their fuel via underground pipes and these pipes are not subject to storm or accidental damage like overhead electrical wires are. Propane is also not subject to the same vulnerabilities as overhead power lines that are exposed to the elements. You can run a backup generator practically indefinitely on these fuel sources. When power is restored, your generator automatically turns off. It seals its connection to your home, allowing electricity to flow into your circuits from the utility supply. All this is done without anyone being present; you can be safe inside at home, you can be at work or out of town. The generator knows its job and stands ready to deploy its power within seconds. The loss of foodstuffs, valuable furnishings and building materials in your home can amount to tens of thousands of dollars of damage from just one storm’s fury if you don’t have a reliable source of electricity to keep your systems running. If you want to protect your biggest asset, and provide a calm, safe, reassuring environment for your family during the next storm, a home generator is worth investigating further. Give us a call today for a free generator size assessment. We’ll handle everything from permitting, to installation to testing to make sure that you get the peace of mind a generator is built to deliver. Safety and security for your family is just a phone call away. OnGuard Generators has several locations throughout central Indiana. 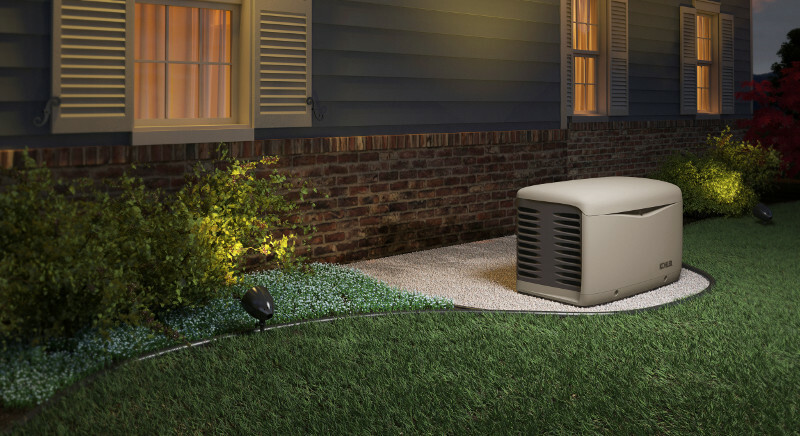 We carry all major brands of standby generators including Generac generators, Kohler generators, Briggs & Stratton Generators and GE generators. We also service and maintain most every make and model generator. Give us a call today (844) 400-9518 for a free generator size assessment.